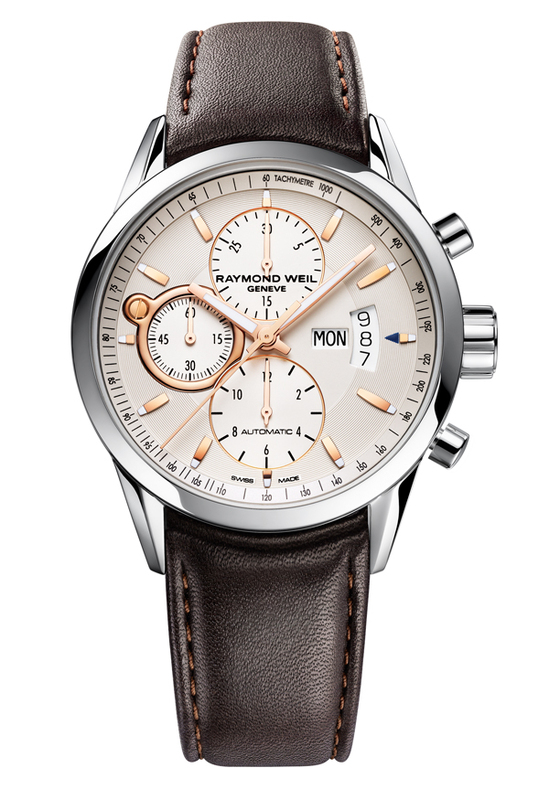 Full of inspiration, RAYMOND WEIL reinterprets its classics and unveils a completely new variation of its best-selling chronograph, the freelancer Steel & Rose Gold Class. Classical and elegant, its 42mm steel case, mounted on brown leather, stands out through the rose gold notes punctuating its dial. This combination of materials and pure lines assures this new model a natural distinction. With the freelancer Steel & Rose Gold Class, the music-loving watchmaker adds a major chord to its 2012 score. More than a successful collection, freelancer is a true reference for the Swiss Brand’s independent family heritage. It is also a range that was created in honor of free spirits, of personalities wishing to remain the masters of their own destiny. Consequently, the collection has never stopped evolving over the years, free of all constraints, but always keeping its true character: having an urbane personality, with an elegant yet casual appearance, with beveled horns and emblematic screws. In 2012, the famous collection combines the robustness of steel with the distinction of the rose gold. Subtle, the combination is perfect. The chronograph, the collection’s best-seller, illustrates its harmony. Its 42mm diameter, polished steel case, classically mounted on brown leather, houses a galvanic, silver, sun-brushed dial, with very elegant rose gold punctuations. In fact, the precious metal illuminates the indexes, the hands, the rims of the small counters at 12 o’clock (30 minutes counter) and 6 o’clock (12 hours counter) and the screwed applique surrounding the small seconds counter at 9 o’clock. At the heart of this array of materials and metals, the timekeeper’s mechanical movement – equipped with a power reserve of 46 hours – beats to the rhythm of time and its intervals. Both urbane and incredibly elegant, classical and very current, the freelancer Steel & Rose Gold Class is a match for all styles.